Easily upload your photos and make custom creations in minutes. Get started with unlimited free prints, exclusively on the app. and 4x4 prints you want—for free! want in just a few taps. exclusives, great offers and fun freebies. The photo app that delivers a book of tear + share prints for $3.99/month. Privately organize and share photos and calendar events with a group. Download the Shutterfly app on iPhone and Android for safe and secure photo storage. Shutterfly provides the only photo storage service that is completely free and unlimited - and we will never delete your pictures. Photos capture your favorite moments and remind you of the important milestones in your life. Shutterfly can help you protect those important memories. With the app, you can capture, preserve, and share life's joy with your family and friends. Instead of deleting photos to create additional room on your phone, you can store as many photos as you want and cherish your memories longer - for free. Our photo apps allow you to easily upload photos, start a project, and access them from any device. Print Photos on Your Phone - in just a few taps! Bring the photos on your phone to life with the simplicity of Shutterfly's mobile app. 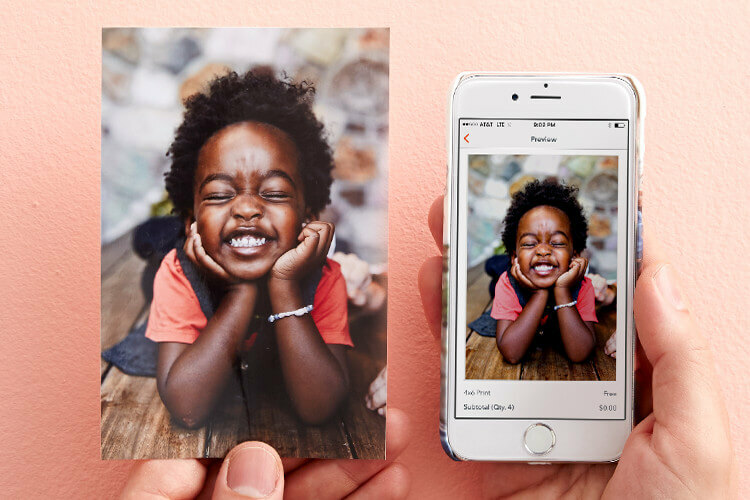 Easily upload your photos with the Shutterfly app and enjoy unlimited FREE 4x6 and 4x4 prints. In minutes, you can transform moments into creations that are uniquely yours. In addition to prints, you'll find that you can personalize a variety of products with your photos, including custom mugs, magnets, iPhone and Android cases, canvas prints, decorative pillows and much more. Whether you're looking for home decor items or a custom gift for a Mother's Day, Father's Day, birthdays or other special occasions (or for yourself! ), the Shutterfly app allows you to design, personalize, and order products right from your phone or tablet. Make sure to never miss another deal from Shutterfly. Stay in the know and get special offers and coupons on your phone.